While the opportunity to hire the best people anywhere in the world is incredible, hiring for a remote team does have its unique challenges. Help Scout is proudly made up of 60 people across four continents, so our hiring process has to be aligned with our remote culture. That means optimizing interviews for people in different time zones and creating a process that allows us to get to know a candidate without ever meeting face to face, all while sussing out whether that person has the skills to succeed in a remote company. Regardless of whether your company hires remote or co-located employees, hiring is hard. It’s no simple feat to juggle multiple priorities, read through hundreds of resumes, and strive for a high-quality candidate experience while moving quickly to hire your next great teammate. And with tech companies competing to hire from the same pool of highly skilled talent, you’d better make sure your company’s hiring process is delightful, engaging, and worth the time-consuming journey for everyone involved. Now at six years old, we’re grateful we attract numerous qualified candidates each time we open a new role. However, we’ve also learned that when we open Engineering roles and rely solely on active candidates, the pipeline lacks diversity across gender and race. We’ve shared our diversity and inclusion strategies and have had greater success when we focus primarily on recruiting top talent from underrepresented groups. Before each hire, I spend time sourcing and reaching out to passive candidates to get them excited about the role we’re about to hire and to build out a more diverse pipeline before we’re ready to launch. It’s imperative to send each candidate a personalized outreach email that shares some of the highlights of the role while also giving meaningful examples about why they’d want to work at Help Scout. When we reach out to potential candidates, we want them to hear directly from us, so we don’t use outside recruiters. We find this makes for a more genuine, meaningful candidate experience from the get-go since the first contact point is someone currently working at Help Scout. Over the years, we’ve incorporated these and other learnings — such as requiring projects and zeroing in on the traits of an effective remote worker, which I’ll get into in a bit — into our 12-step remote hiring process, which can take anywhere from two to four weeks. Since we’re a remote company, the glue that binds together our hiring process from start to finish is video chat. Here’s what our process looks like each time we decide to hire a new remote team member. When it’s time to add a new Scout to the team, we form a hiring team to get the job done. Hiring teams at Help Scout always consist of the hiring manager for the new role, two other people from that team, and someone from the People Ops team. Since it takes time and effort to hire each time, we change up the teams depending on who is available, who has experience hiring, and who is excited to be involved. 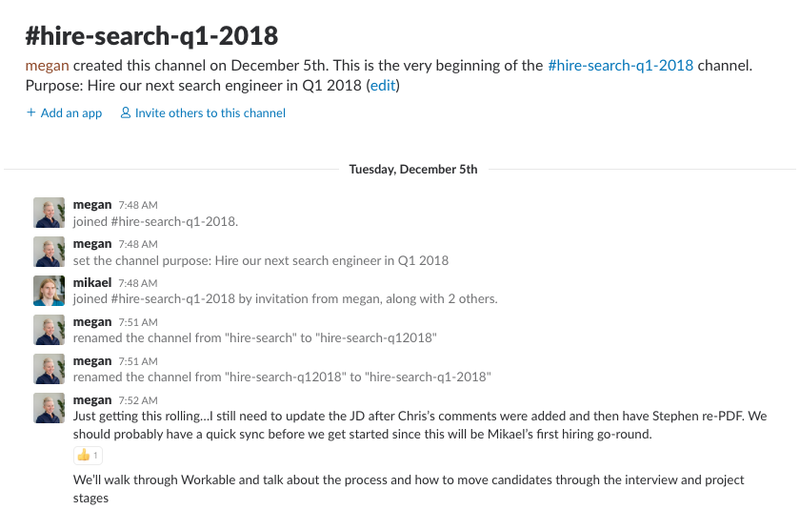 Once the team is set, we create a Slack channel to discuss all things related to the hire. From sharing the job description to candidate updates, the Slack channel keeps everyone in the loop. Is the job description finalized? Are we in agreement about the process for this hire? Do we have a take-home project for this role? If it is a role we’ve hired for before, is the project updated? What skills and traits are we hoping for in this hire? Once we have answers to each of those questions, we’re ready to hit the ground running. When someone applies for a role at Help Scout and looks to be a strong match based on their resume and application answers, they begin the process with a 30-minute video chat with the hiring manager. For our Engineering roles, that most often is our VP of Engineering, Chris, or our Engineering Coach, Megan. The main goal of these conversations is to see if the candidate would be a great value add to our team. While it’s critical that candidates support our company values and embody a few key traits, we don’t aim to hire people that look, talk and think just like us. Instead we ask: What does this person bring to the table that we don’t already have? This first chat gives us the chance to learn more about a candidate’s background and experience while giving space for the candidate to convey their excitement about the role and their feelings for Help Scout. The first chat also shines a light on whether the candidate reflects our values (helpfulness, excellence and ownership) and would be excited to join a team of empathetic, customer-focused people. We also zero in on traits and values that align well with remote work. The people we hire have to be great at managing their priorities and working autonomously for large blocks of time with little to no management. And since remote employees will communicate mostly in writing, they need to be great writers. We tease out writing skills throughout the hiring process so we know potential employees can communicate clearly about complex issues. It’s always helpful if a candidate has worked remotely before, but it’s never a deal-breaker if they haven’t, as long as these skills are present and there’s sincere excitement about joining a remote-first company. Get your ducks in a row! Download this handy cheat sheet for a successful video interview. If things are aligned in the first screen, candidates move on to a more technical conversation with a current member of that team, where they dig in to juicier questions about how candidates problem-solve. Our technical chats never include coding challenges or white-boarding — instead, we ask example-based questions that give candidates a chance to demonstrate their knowledge and experience. For an Engineering role, this might look like detailed questions about a candidate’s programming experience, or a discussion about challenges they faced in previous roles. For our Customer Champion hires, our Support team might ask about a time the candidate had to deal with a difficult customer, and see how far they’re willing to go to find answers when they don’t know something. In addition to assessing depth of technical knowledge, we also place significant emphasis on a candidate’s sense of collaboration, independence, and communication skills, since we’ve found these traits are critical to being a successful remote teammate. When a candidate gets a green light after the first two chats, the next step is a brief logistics chat with someone from People Ops to check in about salary expectations, timeline, and the benefits that come with working at Help Scout. I always leave time for them to ask me any questions that might be lingering. This is the right moment to have this conversation because the next step involves more energy from our candidates and we want to be on the same page before asking for more of their time. It’s good to be aligned on salary early so that if we get to the final stage with someone, we can make an offer they’ll be excited about and more likely to accept. Because Help Scout cares about maintaining and building on our wonderful company culture, I also like to ask a few questions to learn what candidates care about and to see whether contributing to company culture matters to them. I love to ask candidates if they’ve worked at a company that had great culture, and if so, what they thought happened to make it great. I get a wide variety of answers that help illuminate what’s important to candidates when it comes to what they value in a workplace environment. If the candidate is still looking strong at this point, the next step is a relevant take-home project that gives candidates a chance to showcase their skills. Requiring a project can work better in the remote application process than in competitive local markets where companies are forced to move quickly or miss out on the most qualified applicants. Projects can also be an important component of D&I efforts, since anyone on the team can judge the quality of a project without needing the person’s name, gender, ethnic background, or any other information that could trigger an implicit bias. Engineering candidates are given a coding exercise that is similar in language and project setup to what they might be working in on a daily basis. Our Customer Champion hires are asked to give a live demo of the product over Zoom and then spend some time in our Help Scout queue responding to realistic customer questions. Although we don’t give candidates a clear answer to how long it should take to complete a take-home project, we do want to be respectful of candidates’ time. Many of them are currently employed and have other life commitments, and shorter project times help keep our hiring process inclusive. We aim for our take-home projects to take under six hours to complete, and we find it takes most candidates about a week to complete them. We create project scorecards that assess multiple facets of the project and ultimately give a final score for each candidate. All candidates who turn in a project receive written feedback on their submission. While the project is certainly an important piece of the process, it is not the sole determining factor for moving to hire. The hiring team considers the project score combined with feedback from earlier stages to decide who moves on to the final stage. The final interview is the last step candidates experience before we ask for references and make an offer. For our Engineering roles, our CTO and Co-founder, Denny Swindle, is the final interviewer who loves to dig into the feedback candidates received from the project. This is also a great opportunity to see how the candidate responds to feedback and gives us some insight into how it might be to work with that person. No matter the role, if a candidate has made it to this stage, we’re feeling pretty confident about them and use this chat to address any remaining questions. As we move candidates to the final interview, we also ask them for three references, and we ask that two be previous managers. This is a guideline, not a rule. Sometimes a person leaves a team because they had a bad experience with a manager or a team (sometimes it’s just a strong difference of opinion; other times an employee may have been a victim in a hostile work environment). What was your day-to-day professional relationship? What are their opportunities for improvement? How would you rate this person’s overall performance, on a scale of 1-10? What advice would you have for me as this person’s future manager? We ask references these questions to get insight into how the candidate works, where they can improve, and how to manage them to get their best work if they were to be hired at Help Scout. After the reference check, the hiring team huddles one more time over video chat to go over the process and discuss the final candidates. We revisit the hiring kick-off meeting where we talked about what skills and traits we were hoping to find and compare those notes against what we’ve learned through the process. We also like to ask ourselves which candidate will bring something to the team that isn’t already present. Then the hiring manager collects all the input and data and makes the final call. The offer stage feels like the last mile in a marathon. All the hard work is about to pay off, but we’re not quite ready to pop champagne bottles. At Help Scout, we love to make offers over video chat when possible, so the hiring manager will email the finalist and ask if they have a few moments to connect for some good news. Once that meeting happens, People Ops will send off the official offer letter via HelloSign as well as an email summary of the offer and benefits that come with working at Help Scout. Then, we wait for the signature … and finally celebrate a great new hire! Even though we are a remote-first team, we do have small offices in Boston and in Boulder, Colorado, and we love to give new hires a chance to meet some teammates face to face. Once the (electronic) ink is dry, it’s time to decide our new hire’s start date and arrange their travel to Boston for employee onboarding! Each new hire meets with all of our team leads to get a high-level presentation of what that team does to help the overall vision of Help Scout. New hires meet with our CEO, Nick Francis, to learn the company history and go over our team values. We also go out to dinner as a team to help further break the ice and get to know the new teammate. Our remote hiring process runs smoothly thanks to a few essential tools. We couldn’t run our remote hiring process without a hiring applicant tracking system. Recently, Help Scout switched to Lever to give our candidates a great experience while increasing our efficiency and collaboration on the backend. We also chose Lever because their company values aligned with ours and because of their commitment to creating smart, actionable blog posts on diversity in the workplace. Lever helps us quickly handle large volumes of applications while moving qualified candidates through our process. Regardless of whether someone is selected for a first screen, we make sure everyone who applies receives a response. How you treat candidates in your hiring process speaks volumes about your company’s values, so be sure to personalize replies where possible and send disqualifications kindly and quickly. 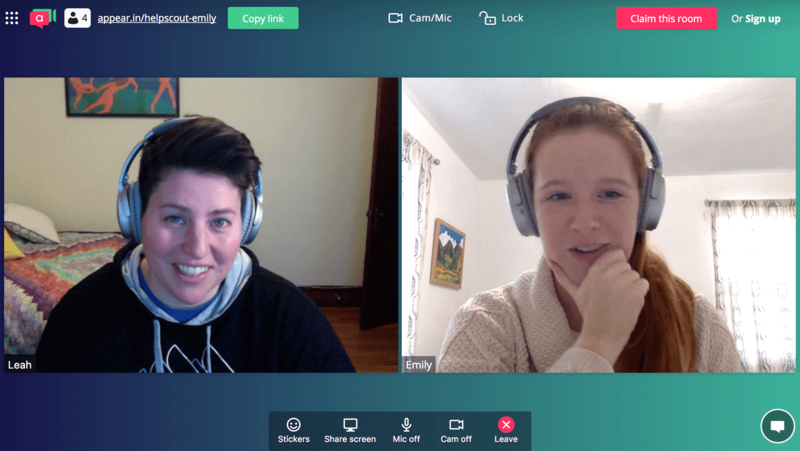 We also couldn’t imagine hiring remotely without the video conferencing tool appear.in! Since our interviews are conducted over video chat, appear.in lets us create a custom link to a chatroom for each candidate and requires zero downloading of software. How delightful. Since I’m often arranging interviews for candidates across the world, I would easily be crying into my keyboard without worldtimebuddy to help me get a handle on time zones. This simple, free tool lets me plug in the cities where people live and then see the time overlap, helping me quickly find the right time for everyone’s schedule. 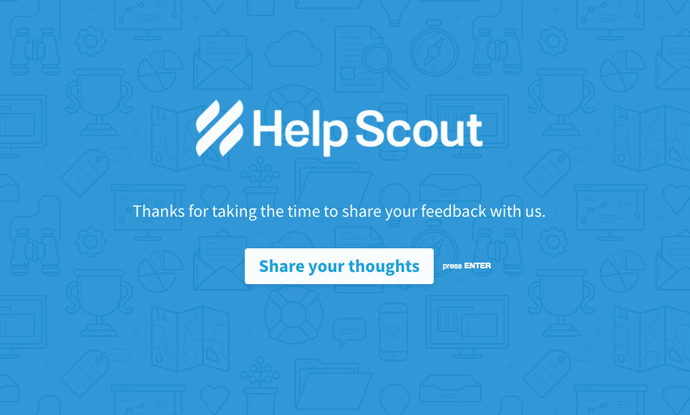 We value and embrace feedback at Help Scout, so asking candidates to share their thoughts on our process is a critical metric for us. To get this done, we use Typeform, a beautiful and intuitive platform that creates surveys and manages analytics. The project was a fair assessment of my skill and ability. The hiring team was responsive throughout the process. The interviewer(s) got an accurate sense of my strengths and weaknesses. In addition to giving candidates a chance to share any feedback they’d like, we ask, “Based on your experience applying to Help Scout, how likely are you to tell a friend or colleague to apply for a job here?” All feedback is good feedback and helps us evolve and improve our process. While it can be uncomfortable to send a feedback survey to candidates we’ve disqualified, it’s an important data point to collect because it helps us know whether we’re creating a meaningful, timely process for all involved. And it’s always great to know that even a rejected candidate still has positive things to say about our process. At Help Scout, we are always talking about ways to put our customers first. When it comes to hiring, our customers are our candidates, and we aim to carry that same mantra along the way. Talented candidates — especially those who wish to work remotely — often have multiple companies falling at their feet, so ensuring you have a human, empathetic and inclusive process can often be the differentiating factor that will say more about your company’s values than your career page ever could. Talent doesn’t always knock on your door; you have to work hard to build a world-class team. Leah is on the People Ops team at Help Scout. She loves building a talented, diverse team that puts customers first. Connect with her on Twitter and LinkedIn.